Retouch or modify photos and pictures. Apply image filters in batch mode. The application can be used to apply arbitrary filters or operators on multiple files at once. It is possible to resize, watermark, rotate, change file format, apply filters (including plug-in filters compatible with Adobe Photoshop) or do a combination of thereof. RealWorld Photos was designed to be extremely customizable. Software developers can create plug-ins to enhance almost every aspect of the application. 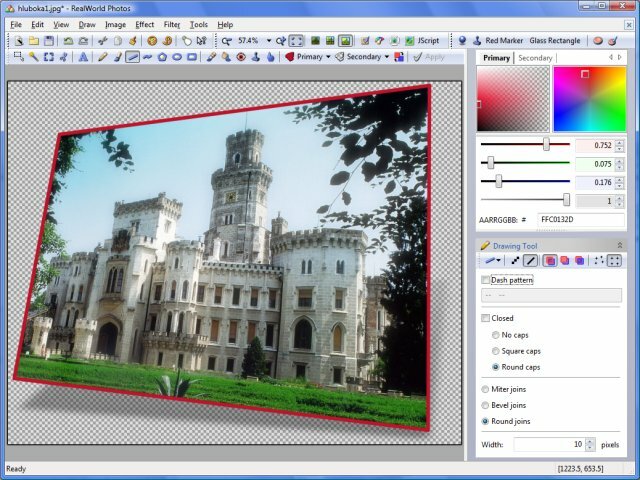 Except the common plug-ins for image filtering, import and export, it is possible to create plug-ins for drawing tools (such as Bezier curves) or windows (such as histogram view). The third party plug-ins have exactly the same possibilities as the built-in tools. The Easiest & Fastest Way to Share Your Digital Pictures! Qweas is providing links to RealWorld Photos 2011.1 as a courtesy, and makes no representations regarding RealWorld Photos or any other applications or any information related thereto. Any questions, complaints or claims regarding this application RealWorld Photos 2011.1 must be directed to the appropriate software vendor. You may click the publisher link of RealWorld Photos on the top of this page to get more details about the vendor.